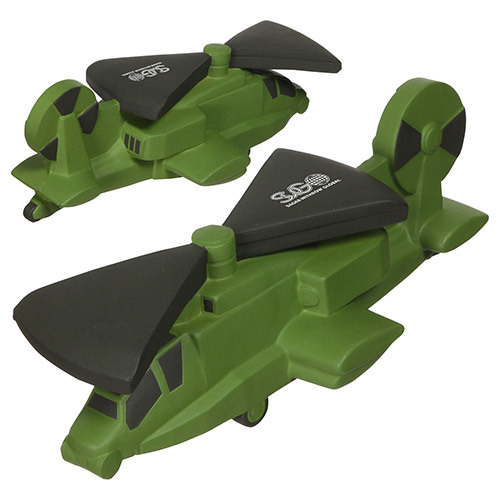 Propel your marketing efforts forward with this military helicopter stress reliever. This eye-catching and handy therapeutic aid measures 5 7/8" x 2 1/2" x 2 1/8" and is an ideal handout for military bases, recruitment stations, ROTC programs, flight shows and so much more. Customize with an imprint of your company name and logo, brand message and more to heighten corporate awareness on an item that will look great on any desk. 5-1/2" x 2-5/8" x 1-7/8"
Bulk / 18 lbs / 200 pcs. / 24 x 13 x 14box. Imprint Area: 5-1/2" x 2-5/8" x 1-7/8"
Imprint Area: 0.875" x 0.25"